Stay Cool all Summer for Less! It’s going to be a hot week! Since we’ve skipped Spring and headed straight into a blazing Summer this year, it’s time for some tips that will keep you cool all Summer while saving some money! Fans are your first line of defense. First, when it cools down at night, that’s a great time to run exhaust fans, whole house fans or window fans in order to bring in the cool air and flush out the hot air. 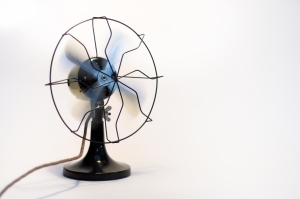 Consider two-way fans, which can be set to intake on one side and exhaust on the other. Additionally, you might not realize that your ceiling fans are useful even when the AC is on. When they run counter-clockwise they’ll keep cool air distributing evenly throughout a room and allow you to set the thermostat a little higher. A little shade makes a big difference. Drop down your blinds and close your curtains during the day to keep the sun out. Lots of windows can be great, but they’ll heat up your home like a greenhouse. If you have large, uncovered windows or skylights, consider investing in some UV film. It will reflect sun back off of your home for cooler temperatures and offers the bonus feature of preventing the sun from fading your furniture finishes, fabrics and book spines. Your landscaping can also be a great source of shade. You can reduce your utility bill by up to $250 a year just by planting a few trees on the South and West sides of your home for protection from the sunniest times of day! Your attic can hold a lot of heat and that affects your second floor rooms. An attic fan or cross ventilation from vents will make all the difference up there. Additionally, properly installed insulation can keep heat out just as well as it keeps you warm in the Winter. Air conditioning can be a real energy hog, but nothing’s more effective. Make sure that you’re using it as efficiently as possible. First, make sure the filters are clean for there best air flow. Next, shut central AC vents in rooms you’re not using and close the doors, too. Your system or wall units will all have a lot less to do if they’re not cooling an unused guest room. A good programmable thermostat can save you a fortune. More advanced ones can even predict how long it will take to cool the house based on yesterday’s weather and will know just the right time to turn on before you get home from work. While you’re at it, make sure the outside condenser unit is clear of leaves and debris and consider plantings which will shade it from the sun while letting it exhaust efficiently. Lastly, everyone knows that the fireplace flue can leak cold air in the Winter, but you might not realize that it will do the same thing in reverse during the Summer! Close that flue to keep the AC in! You might not like it, but sweating is your body’s natural defense against overheating. Make sure that you’re drinking enough water because if you dehydrate, you won’t be able to sweat for evaporative cooling and your body will overheat much more quickly. If you’re drinking a lot of iced coffee or cool cocktails, make sure you compensate with a glass of water periodically since caffeine and alcohol both dehydrate you. Additionally, have you ever noticed that hot countries seem to have the spiciest food? That instant whole body sweat that hot peppers cause will cool you down naturally when a breeze runs over it. Speaking of mealtime – consider spreading out smaller, lighter meals over the day rather than eating 3 big ones. The more calories your body metabolizes at once, the hotter it gets while you digest! If you like these tips and want more, please “Like” my Facebook page at JackieScuraSays.com! I post household tips, real estate news, fun local events and more every day so that you’ll never miss out!